Medical Cannabis has been available in Colorado since 2000 when Amendment 20 passed by 54%. Since then medical cannabis has evolved to treat patients with a wide variety of symptoms. I you are interested in getting your medical card, we reccomend reading over some of this information. 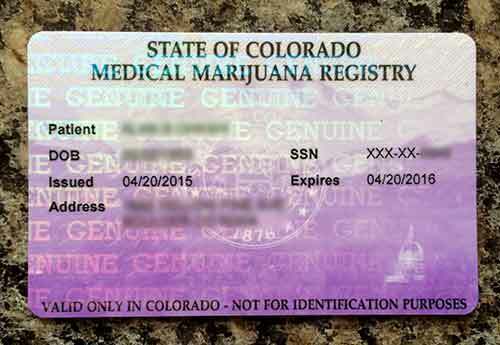 HOW DO I OBTAIN MY MEDICAL CANNABIS REGISTRY CARD (FORMERLY KNOWN AS A RED CARD)? If you suffer from any of these ailments and are interested in treating them with medical cannabis, you must see a doctor who can write you a referral. After obtaining your referral and having your registry application notarized, you must send your application to the CDPHE via Certified Mail. Make sure to keep copies of all your documents! AFTER I SEE THE DOCTOR, CAN I PURCHASE RIGHT AWAY? Colorado Harvest Company can serve first-time applicants as patients using your temporary documents for up to 35 days while your application is being processed. You must bring us copies of your application and physician referral, as well as your Certified Mail receipt and driver’s license. Please bring all of these documents every time you come in, even if we have served you before. IF I’M RENEWING MY MEDICAL CANNABIS REGISTRY CARD, CAN I USE MY TEMPORARY DOCUMENTS? Unfortunately, due to state regulations, we cannot accept renewal paperwork. Please be sure to renew your card at least 45 (but no more than 60) days before it expires to avoid an overlap. HOW DO I ASSIGN COLORADO HARVEST COMPANY AS MY CAREGIVER? WHAT ARE THE BENEFITS? Our members receive price breaks on all three pricing tiers, as well as 10% off all edibles and other products as well as a signing bonus. Please speak to our front desk to find out how to assign Colorado Harvest Company as your caregiver!